As a Deacon in the Flitwick Parish; I would like to take the opportunity to give you a brief sketch of my background and family. Janet and I moved to Harlington in 1985 with our young family and began to attend St Elizabeth’s in Toddington. We had moved from Solihull in order for me to take up a new job in London. I had previously worked for Beecham Foods and various divisions of the Dunlop, having read Business Studies at a Polytechnic in Coventry. Over the next few years I worked for two consultancies in London, then in 1993 I started my own practice which I successful managed until of my diaconal ordination in July 2006. Over the years our family took an active part at St Elizabeth’s with Ruth and Thomas receiving first communion and confirmation in the Dunstable parish. My journey to the diaconate began one Easter when our then parish priest asked me if I had ever thought of becoming a deacon. After much reflection and conversation I agreed to become a candidate, being accepted by Bishop Kevin I was enrolled on the programme of formation. I celebrated my ordination with the parish and my family in July 2006, fulfilling my ministry across the whole Dunstable Parish. 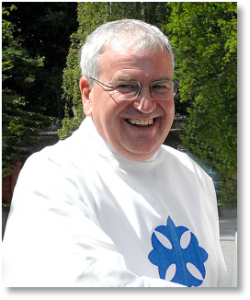 In 2010 I became deacon at Sacred Heart in Flitwick working with Canon Denis McSweeney. In 2015 I took on the role as Pastoral Administrator on the death of Canon Denis, which I held until end of 2017. The past few years have held many changes and challenges with the different paths the parish has had to follow. In September 2006 I became the Chaplain at Cardinal Newman School, enjoying four fascinating and rewarding years serving the staff, students and parents. From April 2008 I was also part of the team helping Bishop Peter and the diocese in bringing his pastoral vision ‘Walking Humbly’ to fruition. I am now looking forward to working within the parish and the pastoral area in many different ways.